CCE began this Sunday. I arrived at the church at least twenty minutes early to set out books, Bibles, pencils, folders, and all of the parent handouts. When students arrived, I stood smiling at the door greeting parents. My co-teacher looked very appreciative that I arrived early; she has more children to corral at home before she gets out the door, and my husband graciously offered to bring our daughters to the church in time for class so they didn’t have to tag along with me early. All of my returning students noticed we have the “big” room, meaning bigger desks, arranged in a circle conducive to learning. It’s a luxury after squeezing around two little pre-K tables last year. I love my co-teacher. I can already tell I’m going to learn so much from her this year. For an ice-breaker, she passed out a little velvet bag full of pennies and told the students they could take as many as they wanted, but they must take out at least one. Her eyes twinkled as one boy took out eleven pennies. When all students had their pennies, she announced we were saying our name and then telling one thing about us for every penny. We learned quite a bit about that one student. Sunday’s lesson focused on the Bible. My co-teacher taught nearly the entire lesson without relying too heavily on students reading the FaithFirst Legacy book. We discussed the meaning of “Testament” and how the Bible is divided into the Old Testament and the New Testament. We highlighted the division of the Testaments into four subgroups: In the Old Testament you have the Pentateuch, the Wisdom Books, the Prophetic Books and the Historical Books. In the New Testament you have the Gospel, the Acts of the Apostles, the Epistles, and the Catholic letters. Then we conducted another exercise that required the students to get out of their seats and move around the room. Students who liked reading stood on one side, those who liked writing stood on the other. Those with first names that were books of the Bible stood on one side, those without stood on the other. (We had two: Daniel and John.) 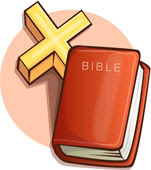 Other questions included those with first names mentioned in the Bible, those who had Saint names as their first or middle names, those who preferred Old Testament bible stories vs. New Testament Bible stories, those who had a personal Bible, and lastly those who had independently read the Bible outside of church or class. On that last question we had students on both sides of the room. We challenged them that by the end of this school year all our class would stand together on the side of reading our Bible because we want to, not because we have to for church or class. During class my co-teacher mentioned the Book of Habakkuk and I had never heard of it. So I told the students my homework would be to read this book. Has anyone else read it? It was quite interesting, but that is another post. It occurs to me that I didn’t ask my daughter what she thought of our class. My second grader started her big sacrament year with excitement and happily told me about reading from the Book of John. I think we’re off to a great year of CCE!